Ashington goalkeeper Conor Grant has expressed his thanks for the patience shown by the Woodhorn Lane supporters and has declared success at the club will come “sooner rather than later”. Ashington’s recent 3-2 victory over Sunderland RCA finally brought an end to a run of seven consecutive defeats during a spell where they recorded only one win in 12 games. 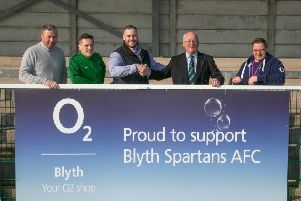 Whitehaven-born Grant, who is in his third season after joining the Colliers from neighbours Blyth Spartans, initially took to social media to make his comments on behalf of the players. However, as he enjoyed a weekend off after his side’s scheduled Ebac Northern League first division clash at Guisborough was postponed on Saturday due to a waterlogged surface, the 26-year-old reiterated his thoughts. He said: “The players have a group chat where we are in contact with each other. I just thought it was a good idea to say a few words to our fans after we brought a bad run to an end, and when I mentioned this to the lads, they agreed for me to go ahead and do it. “When you lose seven games in a row, no one on the outside knows what is going on, so it was a message to explain to the fans where we are at and what we are thinking. “The string of poor results didn’t do the club justice or were fair on the management team. “Obviously we were not playing well, but it was fine margins all the time. Wallsend-based Grant continued: “Now we are hoping to kick on. We have got 12 league games left and looking ahead, our aim is to collect as many points as we can. Grant, who has played more than 100 games for the club, added that he has bought into what the management team of Steve Harmison, Ian Skinner and Lee Anderson are trying to achieve. “I love the club and the people, and how the management team are looking at a long term project,” he said. Meanwhile Grant is nurturing another aspect of his game – as stand-in skipper. “When Craig Scott and Ben Christensen are not in the side I wear the captain’s armband and am growing to like it more,” he added. On Saturday, February 18 Ashington are without a game. Conor Grant’s post on Ashington FC’s Facebook page following the victory over Sunderland RCA.